The Impossible Project is just that! Photography teaches good philosophy if you are aware of what is happening in your life: try taking pictures with a 35 year old camera and use space age paper to make instant pictures. For me, in the beginning, it is indeed impossible. 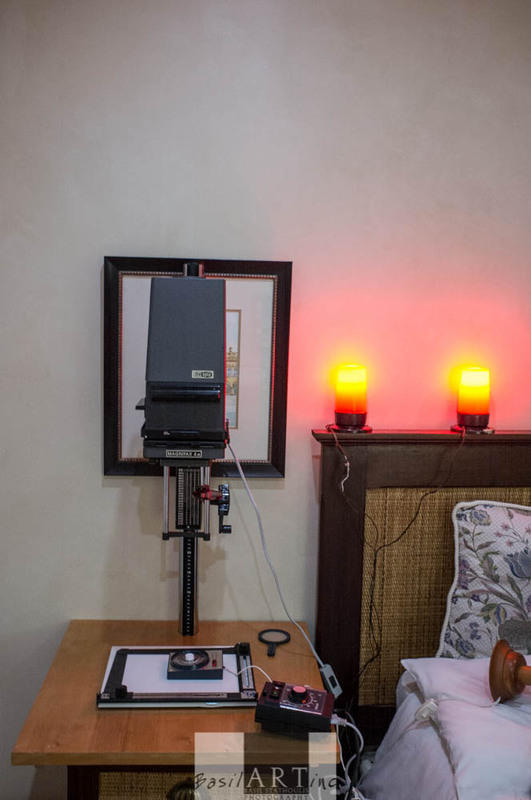 I first heard about Polaroids still in use in Italy from Willem Oets, when he attended his first TPW (Tuscan Photographic Workshop) in 2011. 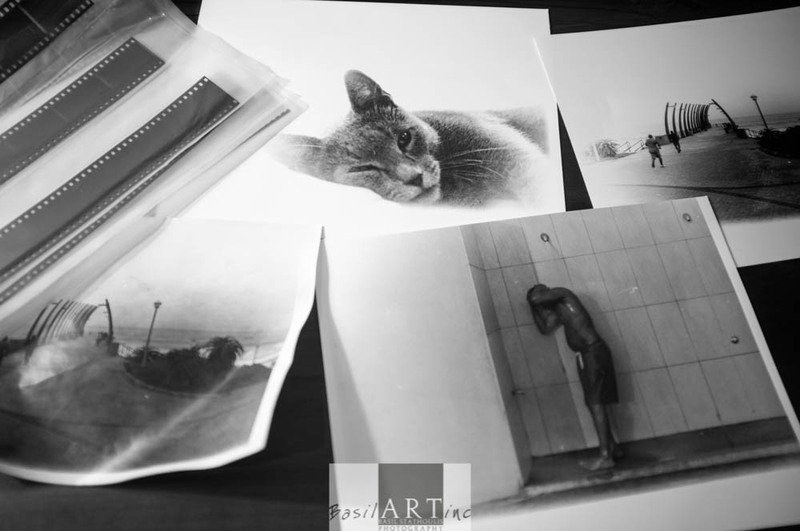 I have played around with developing and printing black and white film in My Darkroom in Africa and love watching a picture come to life. After my tantalizing introduction to instant photography I knew it was a lifestyle I wanted to explore. In this age of instant gratification instant photography is actually not instant at all. 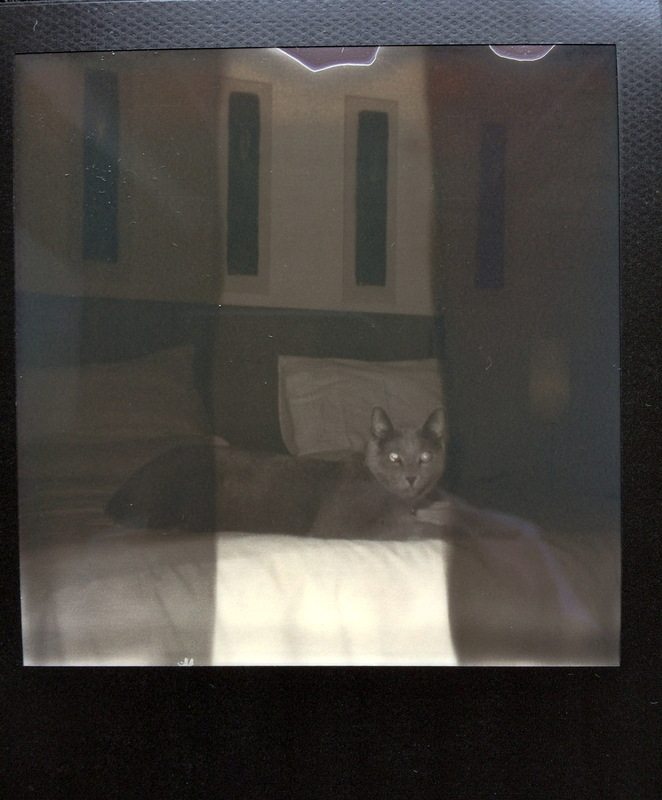 Even the modern Fuji Instax film takes a minute to show a washed out image and ten minutes to mature. Furthermore, although a picture appears on paper, there is no instant digital sharing option, and the picture really is one of a kind. In July this year at TPW I met the master of light and prints, Enrico Borgogni and have now embraced instant film cameras and love it. When we all presented our digital portfolios by way of introduction at TPW this year, Enrico passed around large prints of his masterpieces. Seeing and touching a masterpiece is far more sensual than looking at a good quality digital projection. 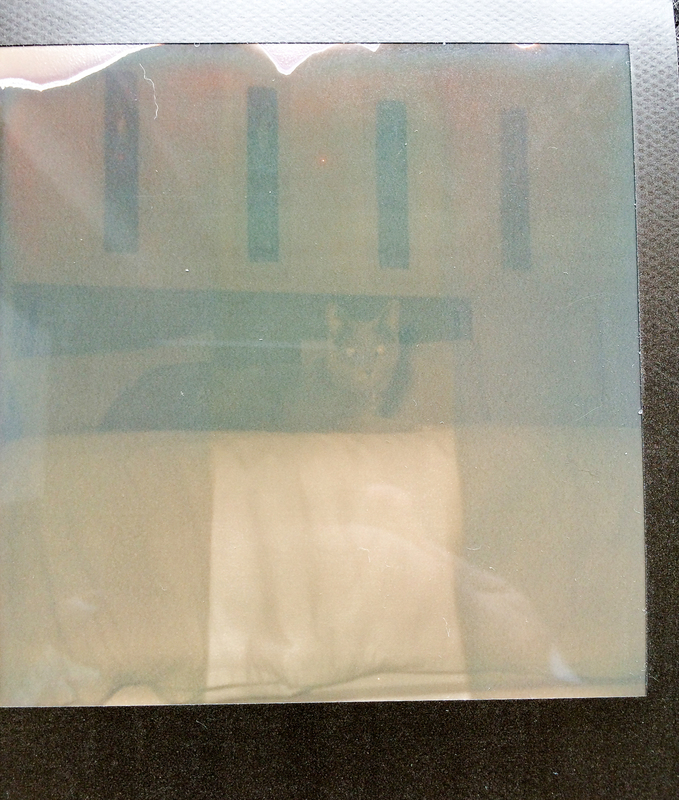 The new Polaroid film made by the Impossible Project needs to be kept dark for 4 minutes after exposure and then there are still chemical defects caused by the old rollers on the camera that set the chemical cascade in motion to reveal the picture. These add a timeless aura to the picture. Using the old Polaroid camera is not easy. There is no light meter, no histogram and no live preview. The exposure compensation ability is crude. Worse still my current camera (Polaroid CL600) seems to have a sticky shutter and the curtain is not moving out of the way fast enough. When I get my pictures right they will have a unique identifying shadow feature on each side. In this day and age of instant mass production isn’t that what we strive for: to be unique. The Impossible Project is teaching me patience; and allows me to be unique. There are two special moments in darkroom work: the first is when you unroll the wet film from the black developing tank and see the negatives, and the second is when your first full size print comes to life in the developing tray and you see the image in the red light. It was a hot and humid day in Durban and I loaded the film into the reels and developing tank in a small windowless and airless room under the steps at home. Then I set about the chemistry of mixing the DF11 Ilford film developer, a homemade stop with vinegar and the Ilford fixer. The temperature of the developer is critical and fortunately Ivor Ginsberg had sent me a thermometer that fitted in the irrigation spout of the developing tank. Using the Durst “Made in Germany” mechanical timer and Mike as a time keeper, I poured the developer into the tank like a celebratory glass of champagne and agitated the mix every minute until I poured that out and poured in the stop to cease the developing process. Then a few minutes in the fix, and after the first wash, I opened the tank lid and peeped at the negatives. My heart sank initially as I had exposed Mike’s film by opening the camera back as we had forgotten how to rewind the film in his “automatic” Minolta 500i. The OM1 was much easier with a manual rewind lever. But the negatives looked alight. I used dishwasher rinse as a wetting agent, then dried the film with a chamois, as I only had an old squeegee that would scratch the film because the rubber had perished. Ivor had sent original film hanging clips so we left them to dry in the shower and had lunch. After lunch I set up the spare room as darkroom. I placed the Meopta enlarger and timer and the Patterson enlarging “computer” ( just a simple exposure meter) on a table. After a few test prints, as I had no idea of what time to use, we found some images appearing. When I changed the enlarger bulb to a full 150 Watt light things really started happening. Ivor had sent some old (from the fifties or sixties) Agfa Bronica paper. This was not a resin paper and dried badly without a proper drier or press. 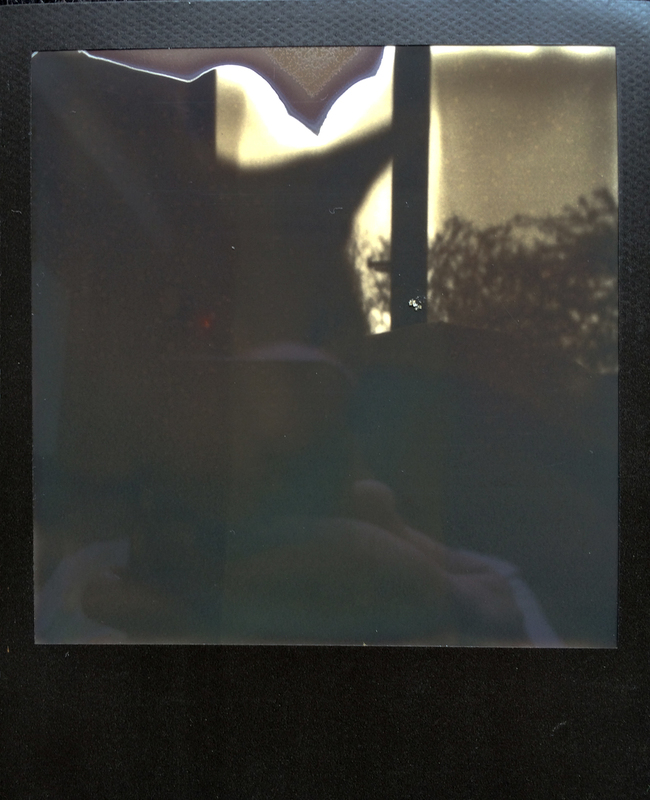 Then we started using the Ilford Mutilgrade resin paper and my first picture was born. The equipment was working well enough to plan a darkroom party at Costa Calla. My camera needed new batteries and the film had to be loaded manually. There were a lot of reassuring levers, clicks and mechanical confirmation sounds. My motor winder missed the engage occasionally and just spun. But the manual winder on top of the camera still worked. I had replaced the small hearing aid type battery, which operates the light meter. The response of the light meter seemed dulled so I had to check it with the Light Metter App I have loaded on my iPhone. That worked a charm. The Olympus OM 1 has an On/Off switch, an ASA ring from 50 to 1600 ISO, a film winder, shutter release button, film release button, self timer and a flash hotshoe. The interchangeable lens has the shutter speed ring at its base, with the aperture ring in the front. That’s it! Oh, and as far as I remember the battery would last a few years. Simple but beautiful! I opened box of film and unplugged the canister. I had forgotten about the celluloid smell.The cartridge fell into my hands and I loaded the camera easily, checking the drag to ensure it was running and loading just the tip to get an extra frame out of the roll of 36 exposures. 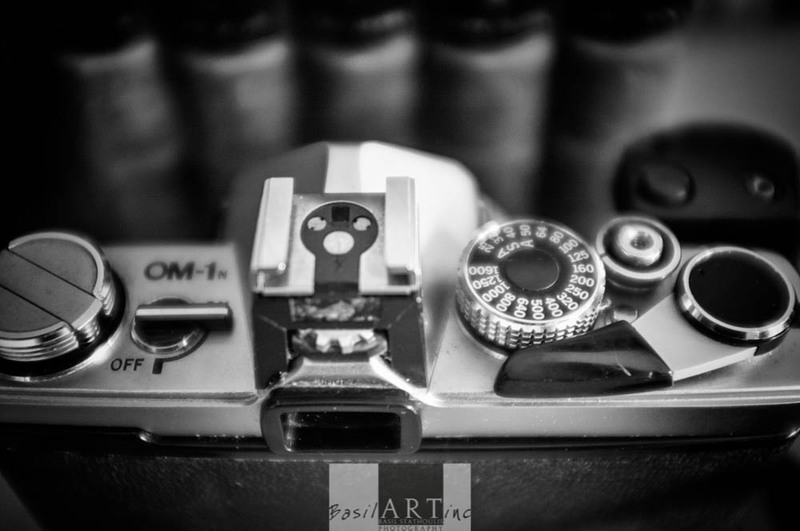 The OM1 is a small camera. The Zuiko optics are great. The viewfinder is tiny and dark especially with an f 4.0 lens. 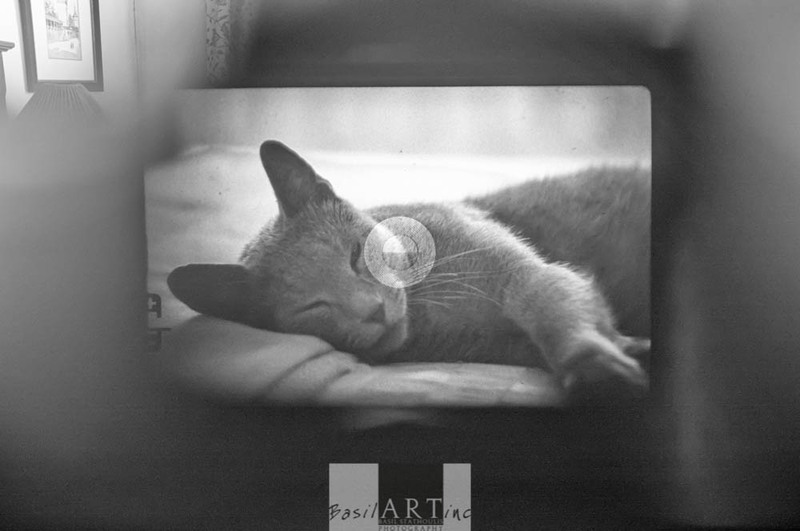 The focusing screen has a central twin prism surrounded by a circle of smaller prisms and then the ground glass. I have another focusing screen that I can insert (yes, they were interchangeable) that is an open circle and ground glass much like the ones in most DSLRs today. There is no diopter adjustment on the viewfinder, so I had to look through my glasses to see. Through the (small) viewfinder of the Olympus OM-1 – note the split prism to assist in focussing. I took a few pictures around the house with an ISO of 125. I had to use the tripod, and also think about the picture I wanted, then check the light reading with my external light meter. The beach was more fun. I felt that I had been transported in a time machine and had arrived 40 years earlier, taking pictures the old fashioned way. I only took about 30 at the beach, though a whole lot more than normal and enjoyed looking at the light, the light meter and caressing my camera. 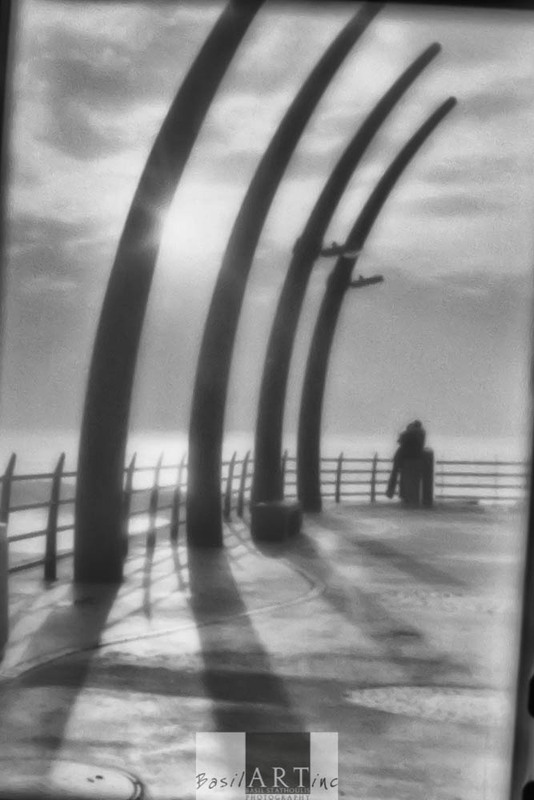 Janvier and I did capture a proposal at the end of the pier. How lucky are that couple to have their special moment captured on celluloid in 2014? A few weeks ago a plan came together that had been hatched four years ago. I made a major challenge to myself, but hedged my bets. The challenge was to embrace modern digital DLSR technology, so I bought camera equipment that performs far better than I make pictures. But I hedged my bets by purchasing some second hand Zuiko lenses for my Olympus OM1. They cost a fraction of what my new lenses did, and weighed only a fraction as well. I had to because about 15 years ago we had a robbery at home where I lost most of that kit, and all I was left with was an OM1 body and motor winder. I hedged my bets because if the digital experiment failed, then I would go back to film. Digital photography has not failed me. I have learnt so much and have so much more to learn, and have made pictures that make me smile. However, roots are important. In life and in photography. 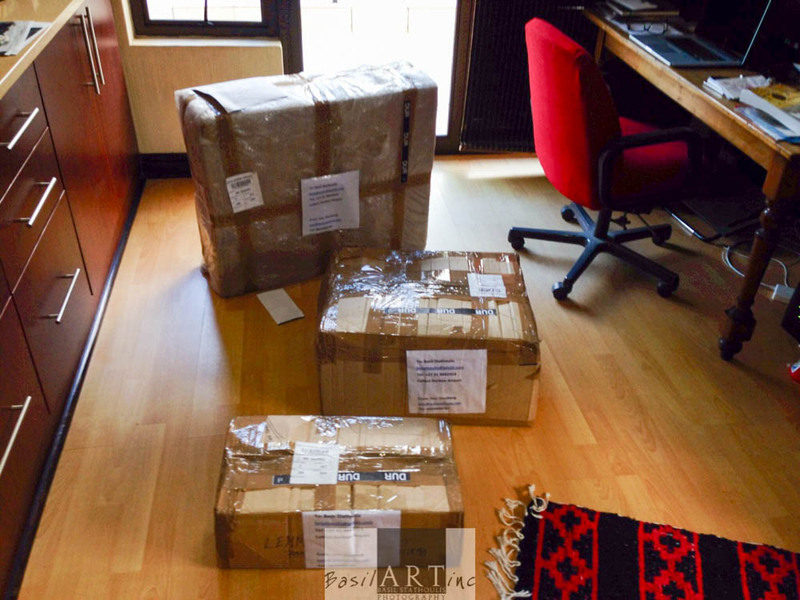 I trawled the Internet for darkroom equipment: like everyone else I asked, I had given my darkroom equipment away. By a stroke of luck I found Ivor Ginsberg’s contact details on one of the smalls of a site and left a message on his mobile. 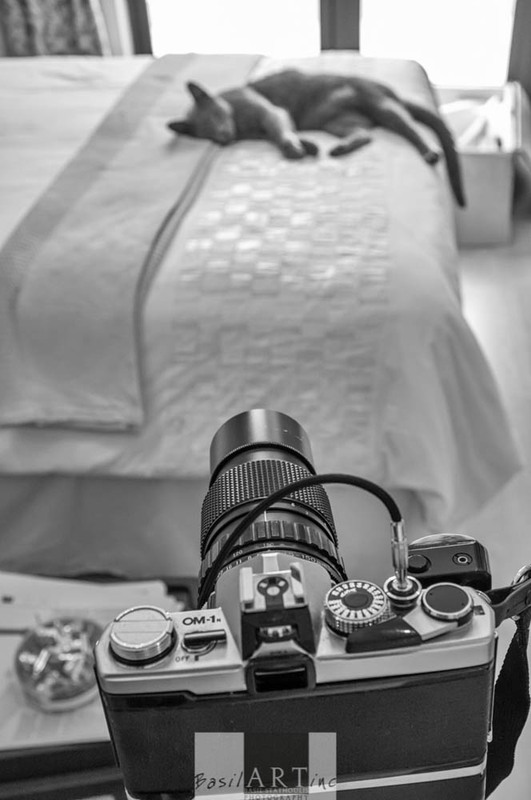 He called back a few days later and three weeks later I collected 44 kilograms of darkroom equipment from the freight office at King Shaka Zulu airport. I had a large Meopta enlarger, 3 lenses, timers, exposure meters, safe lights, trays, developing tanks, measuring cylinders and some old Agfa Bromide Paper. For modern film and paper I had been told about Photomax in Durban, so on the way to collect Ivor’s delivery I stopped by and bought Ilford film, paper, developers and fixer. Later I bought a contact print device there as well. Germany. 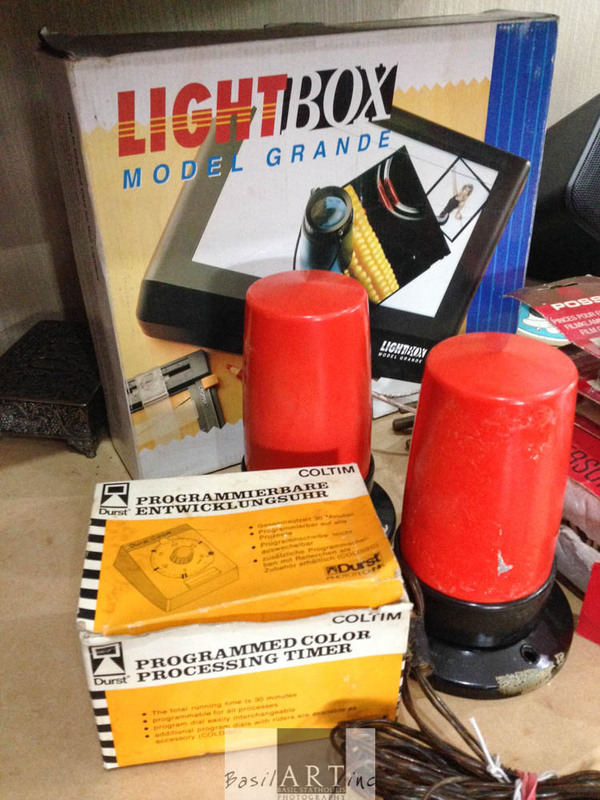 A Paterson Exposure “Computer” in the box, with the instruction manual. Made in England. The Meopta enlarger in its original cardboard box. Made in Czechoslovakia. Like the timer. I stored the film, paper and chemicals in the fridge. I had to look up equivalents for Stop (used vinegar to make up a solution of 1.5% ascetic acid) and dishwasher rinse aid as a wetting agent. I cleaned my lenses and camera. 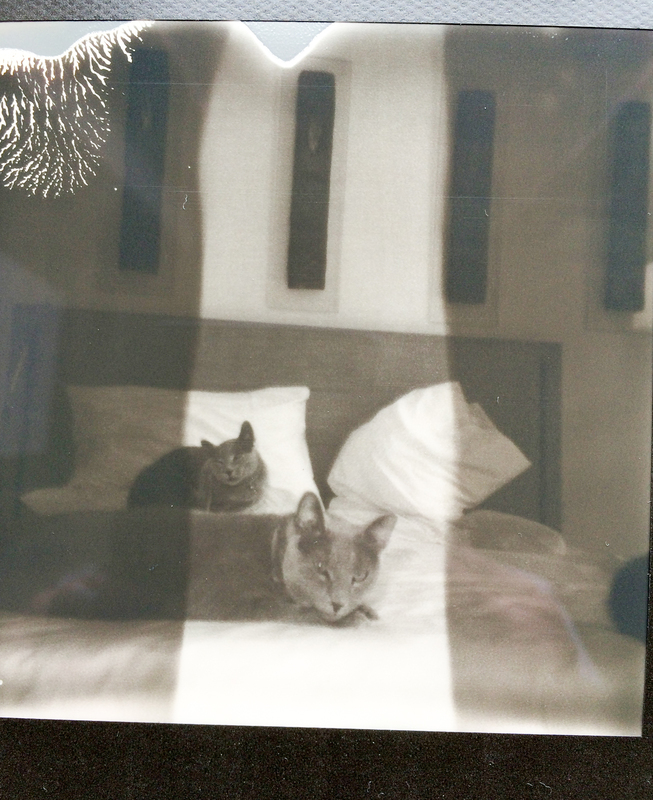 Ines tolerated the spare room beginning to look (and smell) like a darkroom. It was time to mix the chemicals, black out the darkroom and take some film pictures! This was to be our last morning on land. I was filled with trepidation. This would be my goodbye to this fragile wilderness and hello to my fragile health. 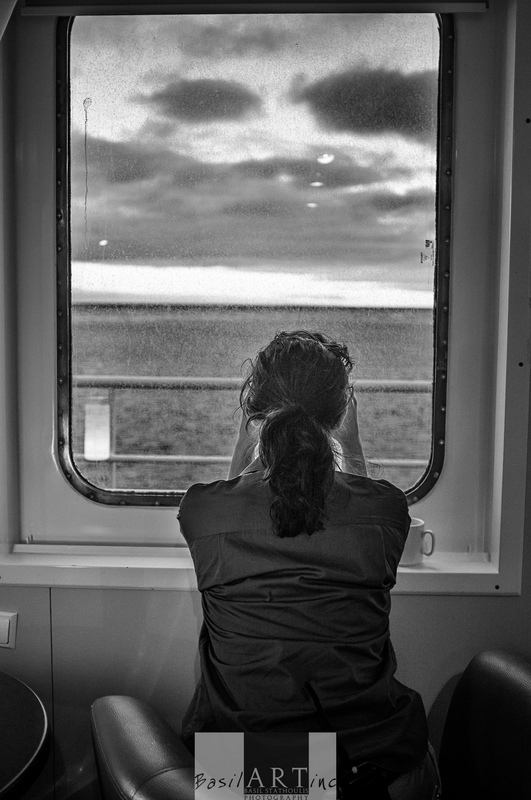 My health was fragile as we were to cross the Drake Passage after the landing. William Brown is anathema. He was born in the 18th century in Ireland, emigrated to Philadelphia with his family as a nine year old and lost his father soon after to yellow fever. He was offered a job as a cabin boy on a steamer and worked his way up to captain. He was pressganged into fighting for the British in the Napoleonic wars. He then established and fought battles around Argentina and is an Argentinian national hero, and popularly regarded as the founder of the Argentinian navy. 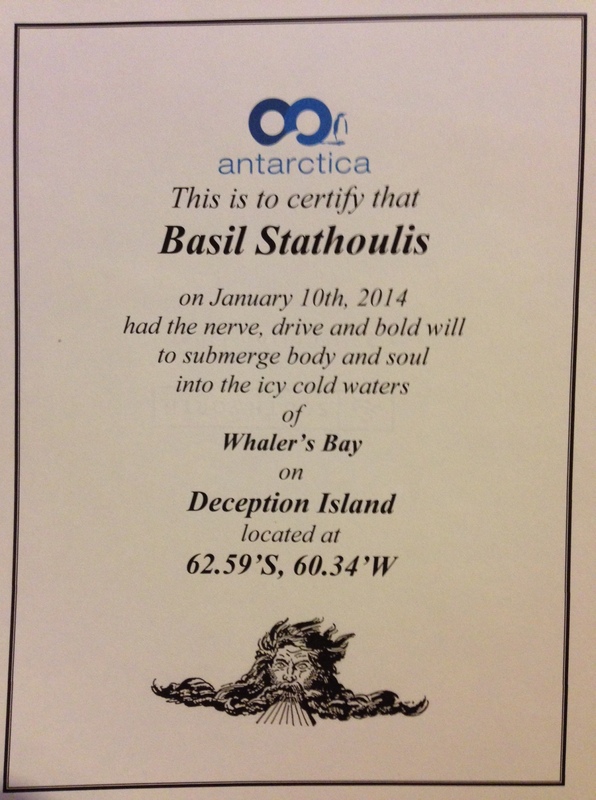 Then the Argentinians named a research base after him on the Antarctic Peninsula. I often wonder how the passage of world history would have changed if it were not for the Irish that stood up to the English and the United Kingdom. Is say this because of one of my great grandparents who was Irish and who came out to South Africa to support the Boers in the Anglo-Boer War. 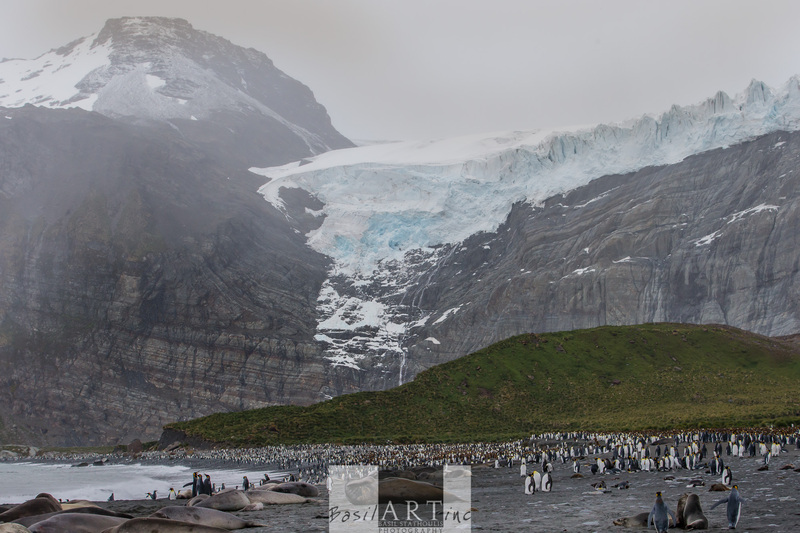 Paradise Harbour is a beautiful natural bay on the Antarctic Peninsula. The mouth is not too narrow but steep mountains rise up from all sides, with glaciers reaching the see in the valleys. We landed at Base Brown, and Argentinian Scientific base that was not occupied. 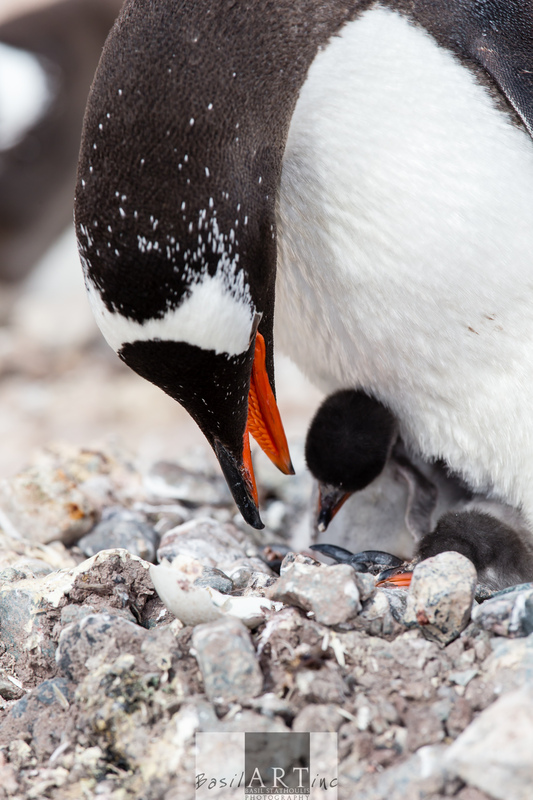 A colony of Gentoo penguins were breeding in and around the buildings. The base had suffered a serious fire when one of the Argentinian doctor who was conscripted into military service set he base alight when a service ship did not have space to take him home after his due service. He and his team were forced to camp in tents till the next ship a few months later. The base has ugly debris in its center. Most of the Vavilov’s passengers fanned around the base and up the hill to the highest point. The came tobogganing down on their backsides, whooping in excitement. Reece, her boyfriend, proposed to the ship’s doctor, Sarah, on top of the hill. There were loud whoops of joy and congratulations as the messages were relayed down the slope to the base. I stood alone absorbing the peace and grandeur of the place. 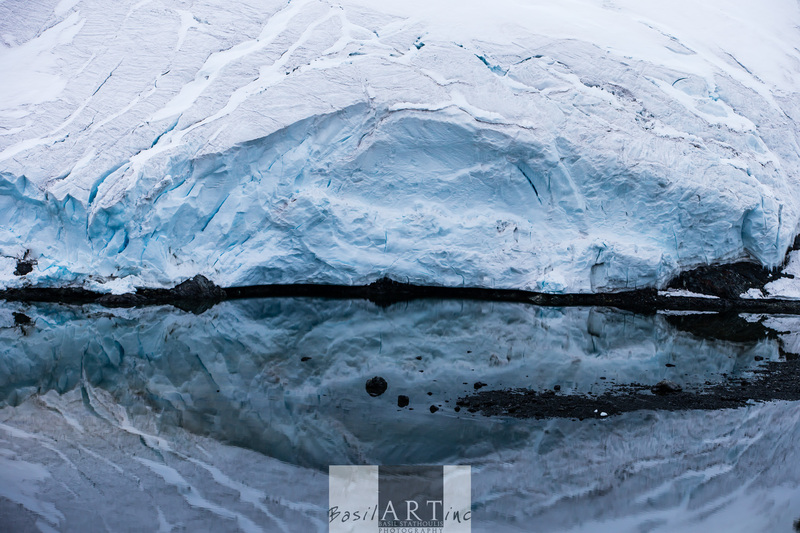 The stillness away from the passengers was intense, broken by occasional glacier calving. 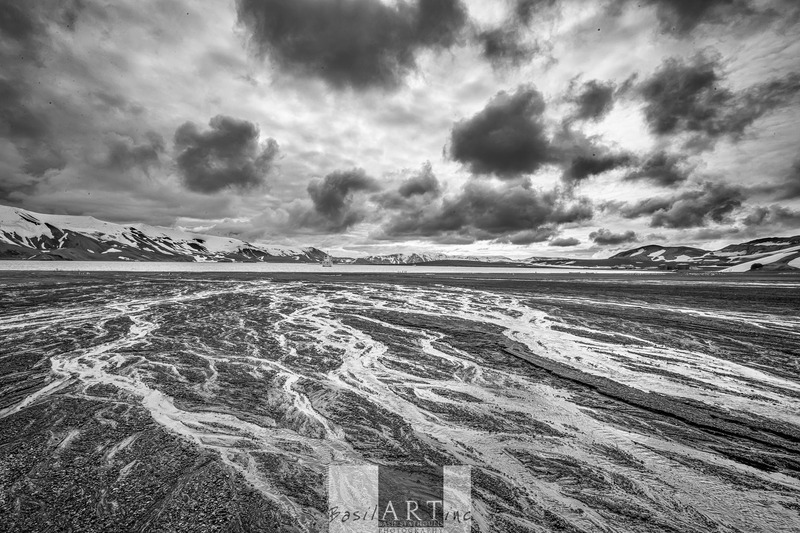 The sea in areas was black and reflected the glacier faces like a mirror. I looked back on the sturdy Vavilov moored in the bay. It was small, but I knew I would be safe in the Drake crossing. I was just scared I would be sick. Then the bay filled with ice as the wind changed. The winds were only supposed to pick up later in the afternoon. Back on board Boris announced that we would be making a dash for the Drake on account of some serious weather that was coming. Oh, boy. My heart sank! 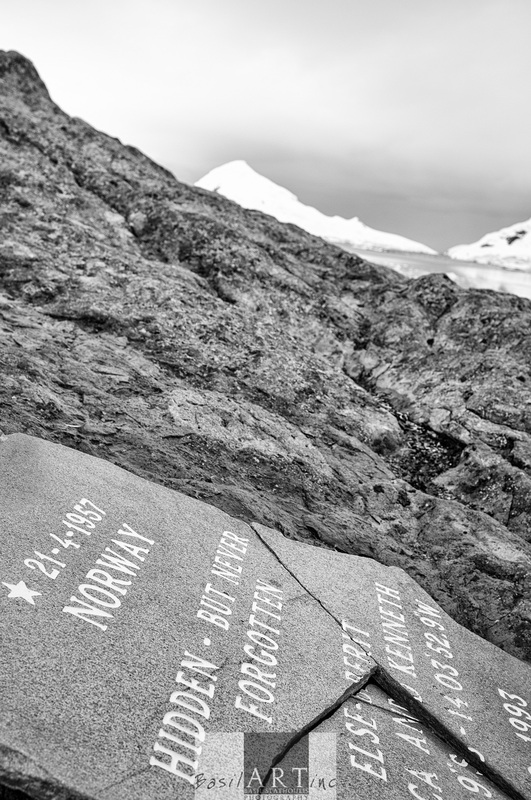 Norwegian grave stone: hidden but not forgotten…. After lunch we entered Cierva Cove. The Vavilov moored in the bay. We lined up eagerly on the gangway. 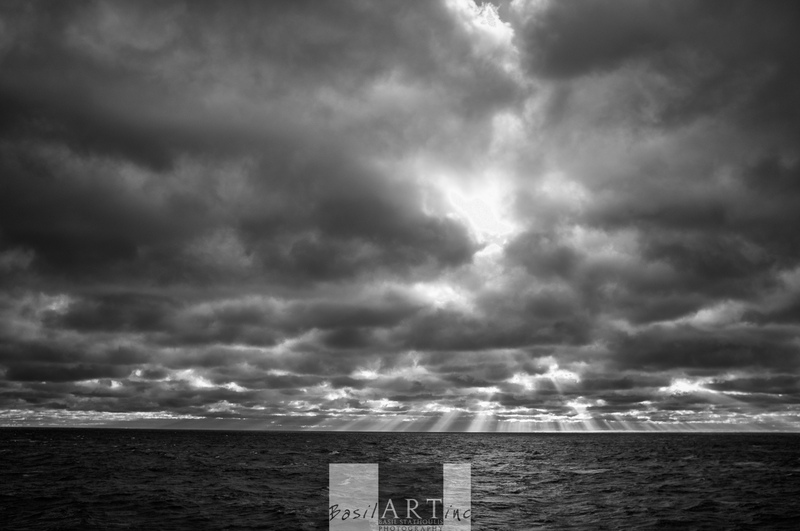 The northern sky was a foreboding grey yet filled with texture. 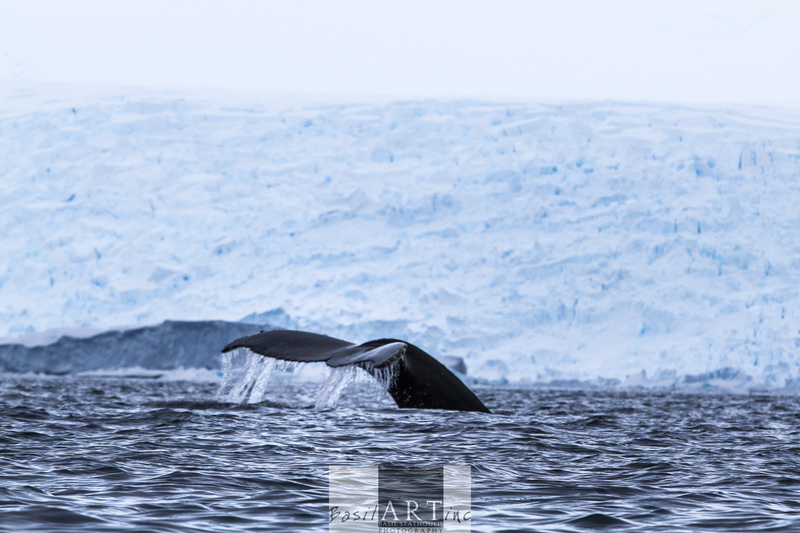 Humpback whales were swimming in front of giant icebergs. Nothing can prepare you for the beauty and peace of this land at the bottom of the world. The ice masses intrigue. From steel blue to pure white, geometric and haphazard, the shapes appear in front of your eyes and fall away as the next more beautiful piece appears. 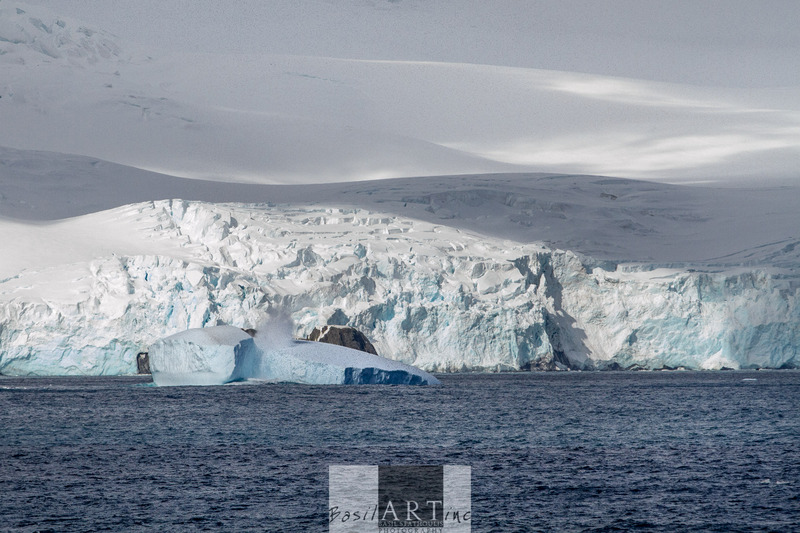 Near a giant iceberg we slowed the zodiac and had humpback whales diving in front of us. Their deep sigh near us as they breathed out resonated somewhere in my soul. I have felt their breath before in False Bay in the Cape, but here in this wilderness I was truly honoured. The most beautiful sight on earth? 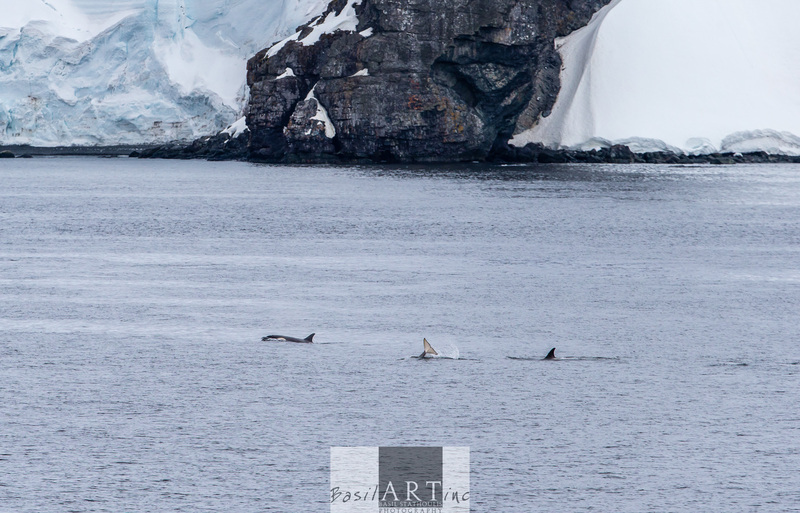 We followed another whale, then another, trying to frame the big tail as it dripped water first against a glacier face, then an iceberg and finally a black cliff. Taking pictures in the freezing cold and poor light from a kneeling position in a zodiac is not easy, but the experience was worth just being there, even without a camera. 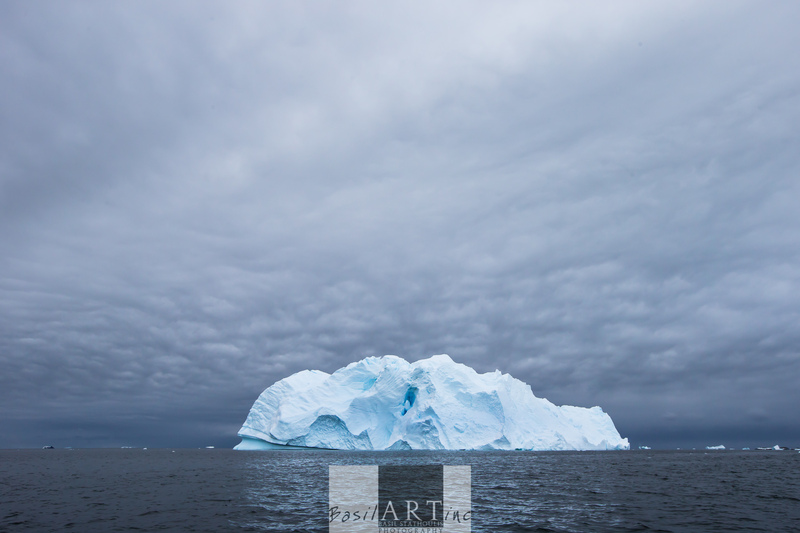 We left the whales and made our way to the western edge of the bay, to look at giant icebergs. Along the way we saw smaller more interesting shapes and shades. 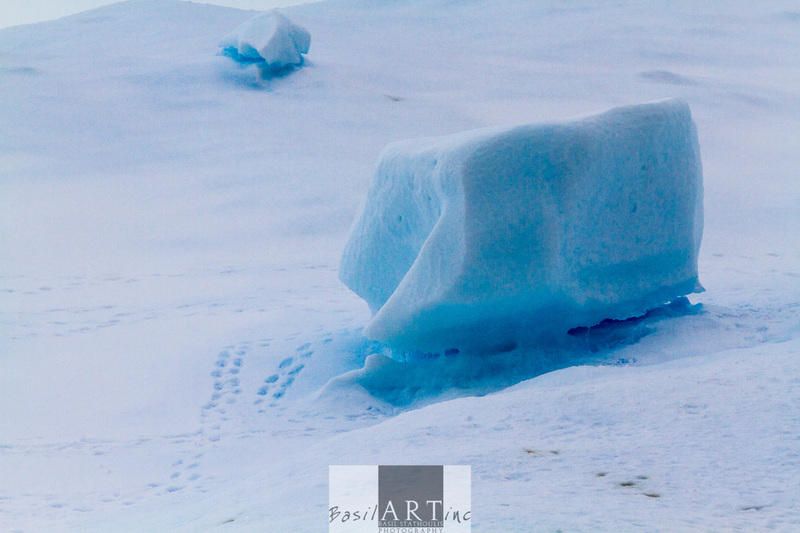 We had penguins on the ice, a small group on a massive slab. Then two on a smaller block. Suddenly they became three as one flew onto the ice from the water. 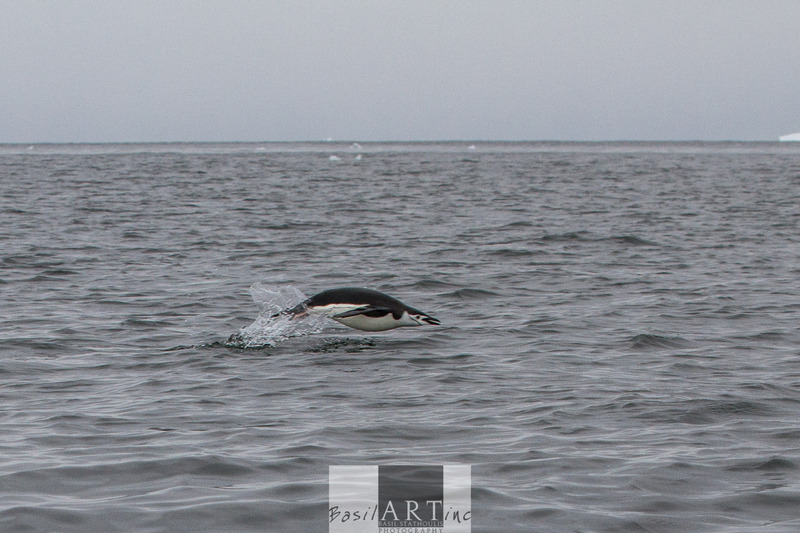 Penguins transform in water as pure swimming machines to land on ice as clumsy clowns. The transition is instant. “Tell him we had a puncture” piped up one voice. “No, tell him a whale breached right next to us and we nearly sank” said another. As we joked and squinted through the sea spray and snow three Minke whales breached right next to us a few times, feeding. It was a beautiful and inspiring sight. Back on board the Vavilov we celebrated with a whisky on glacier ice. As we steamed out of Cierva Cove we had humpback whales circle feeding on either side of the ship. The lounge erupted like a rowdy football crowd, with each side cheering as their whales breached. I have no idea why we still hunt whales. Nor do I understand why we are systematically destroying our fragile earth? 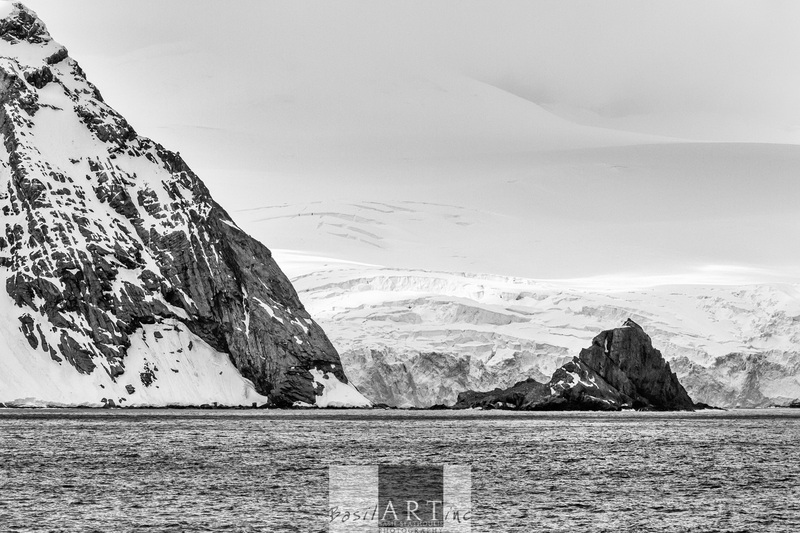 The Vavilov had sailed on the north of the South Shetland Islands because thick ice prevented us entering the Antarctic Sound. 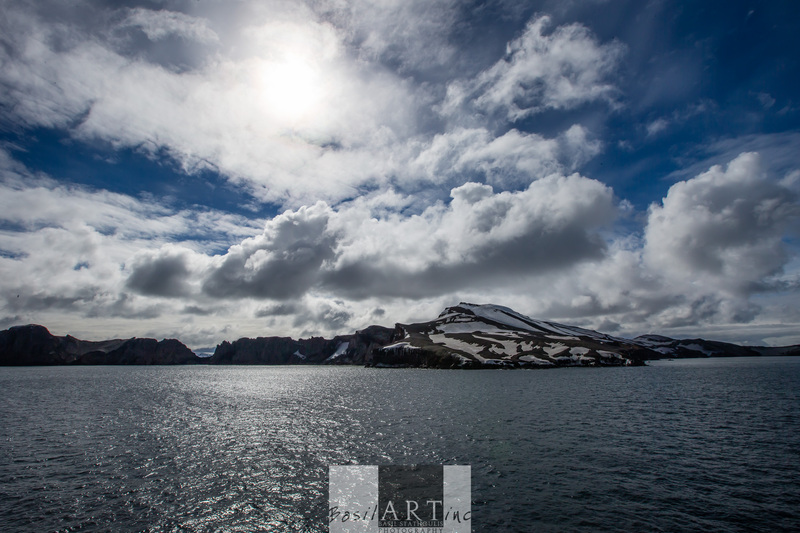 Now we had turned and were sailing in the channel between the islands and the Antarctic Peninsula. On ether side of the ship rose towering black cliffed mountains with thick glaciers cutting the valleys right to the sea. After a fresh smoothie from Amanda and breakfast we landed at Mikkelsen Harbour, facing the great continent. The ice and snow shone bright white in the sun, under a blue sky with small cumulus clouds dotting the horizon. We landed amongst the debris of whalebones, geometric vertebra lying like toys in the gravel and ice blocks. 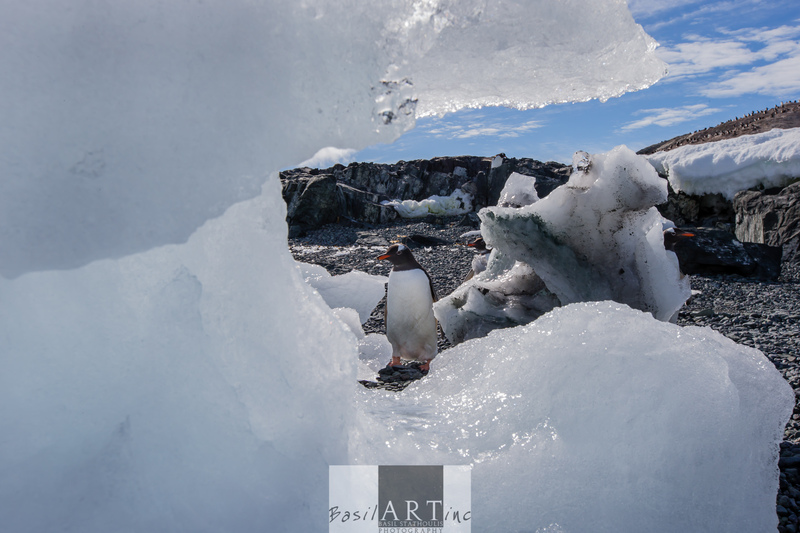 I lay down to compose pictures with the ice shapes and the Gentoo Penguins came to investigate me. They were inquisitive, like short-necked giraffes; dreamy eyes stretching forward to see what was lying on the ground. After a while I climbed a short hill to the other side of the bay, where the weathered red container structure of an Argentinian base scarred the rocky promontory. 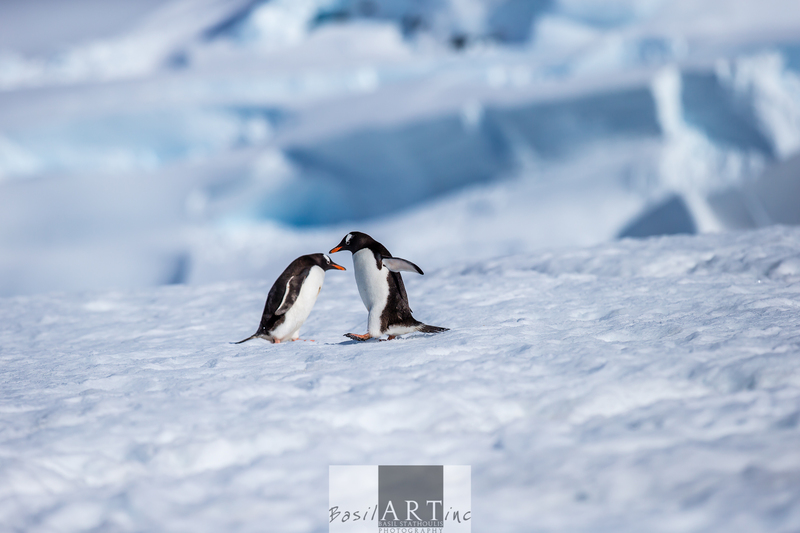 Before reaching the Gentoo colony at the base, I played around with penguins on snow highways and then moved to the colony. From there we had sight of a long highway coming straight at us down the slope, but somehow the pictures were not working. There was a lot of excitement around the base. The penguins were not feeding but roosting on their eggs. Movement was limited. 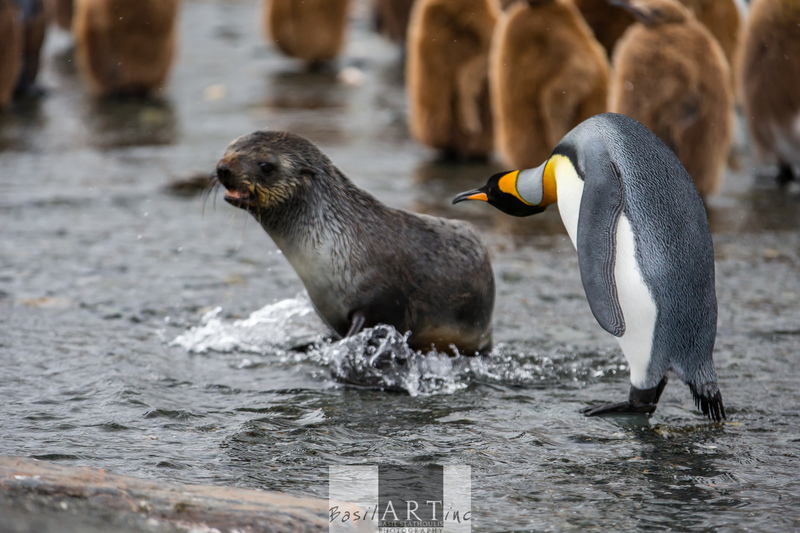 Then slowly one would bend down and nudge the speckled white egg as the chick breached the shell and came to life. We saw a few at various stages of birth. Time seemed to stand still as these noisy garrulous ungainly on land birds shifted up and moved back to allow the egg to crack and the young chick to hatch. We had to rush back to catch the last zodiac to the ship, passing another Gentoo on the beach that was pecking at the remains of one of his kin. On deck the sun remained low and it got much colder. The kitchen staff had put barrels on the stern and had prepared a braai (a South African barbeque). The smells were incongruous for me and as the meat came off the grill it froze to the plate in my hand. 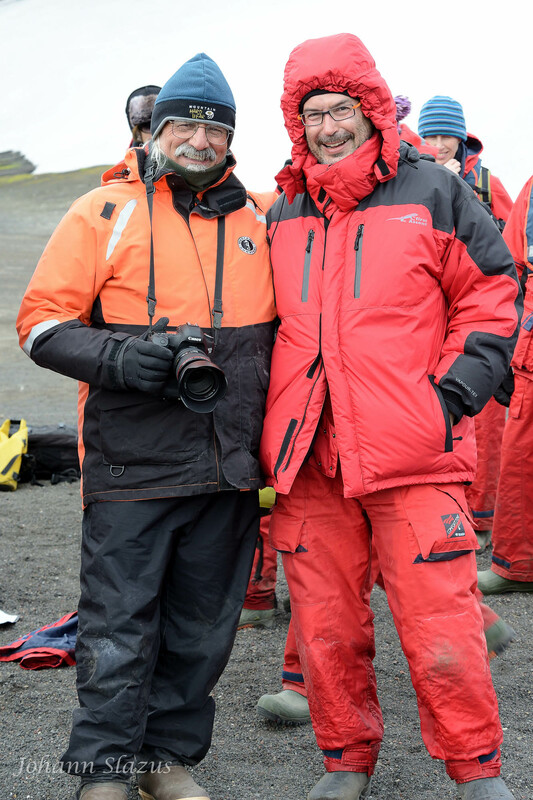 I was warm initially from the activity on Mikkelsen Harbour and did not take all my outer gear to the braai and froze. I found a protected spot and stood chatting to Luis who guides for Rock Jumper birding tours and also Suricato in South America. peninsula and us we spotted 5 Orcas, about 1 kilometer off the starboard. What excitement on the ship. 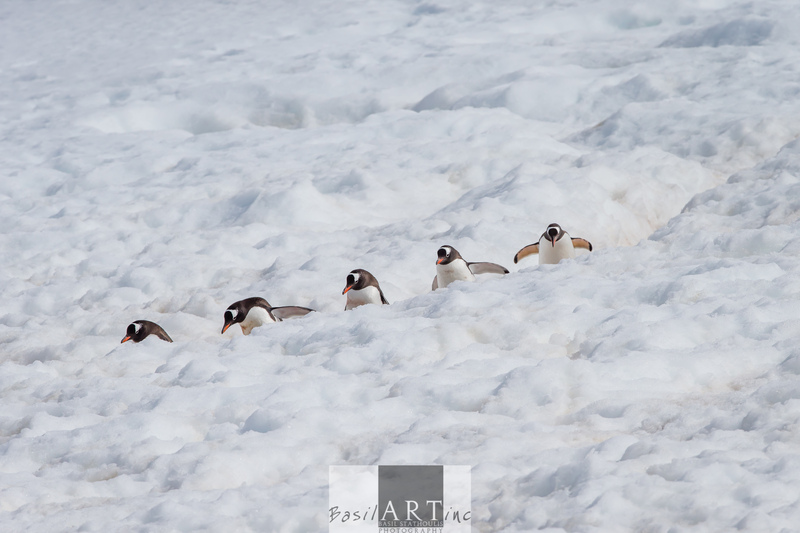 Penguins on snow highways. That was one of the photographs I wanted to capture, Today was the day. 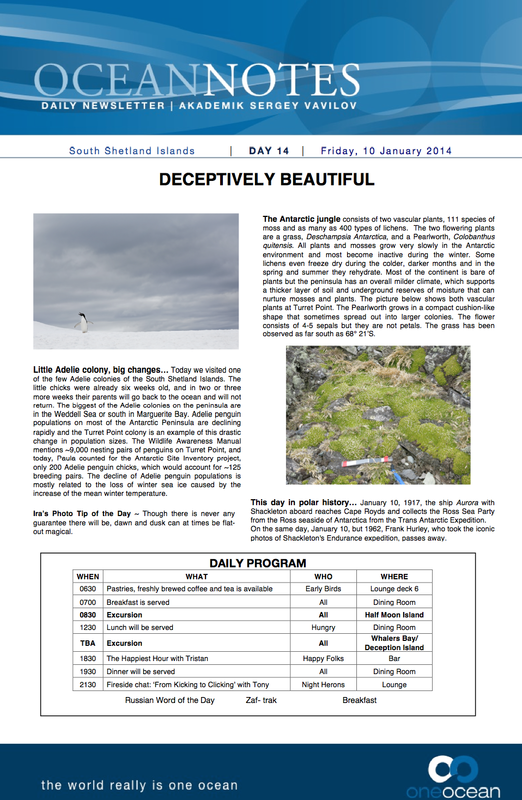 After three days at sea it was exciting to be doing an excursion again. 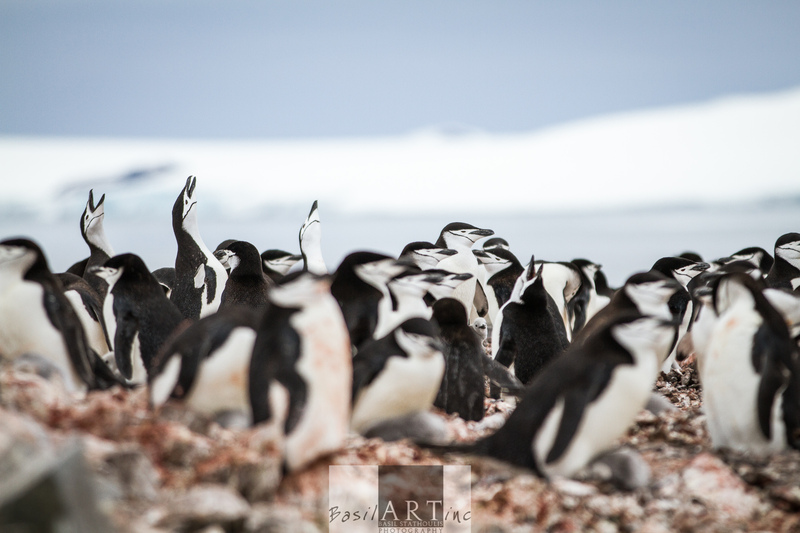 This morning we would be landing on Halfmoon Island, with three big Chinstrap Penguin Colonies, and perhaps one or two Macaroni penguins. It was like being in grade school again. We were all very excited. Waterproof bags were shouldered with camera kit and after breakfast we loaded onto the zodiacs and landed near the wreck of an old rowing boat. 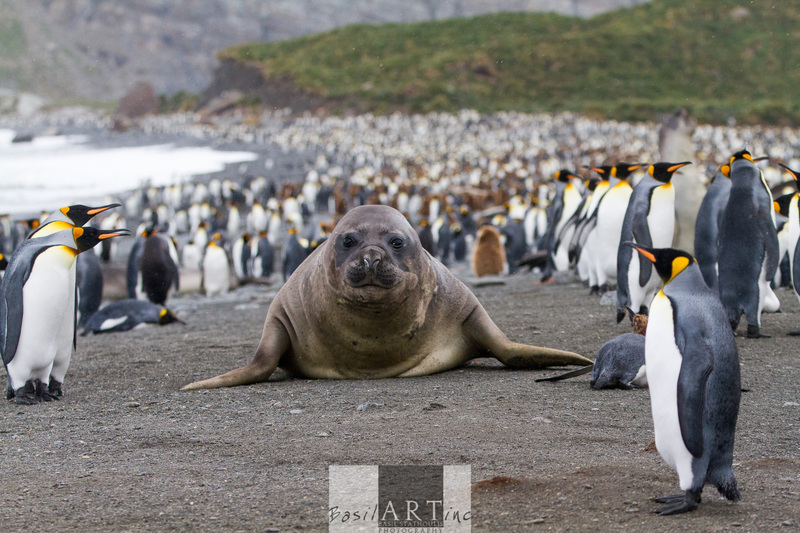 There were no seals here, just snow ice, penguin highways and penguins. I stepped of the contour highway that passed the first colony on my right. 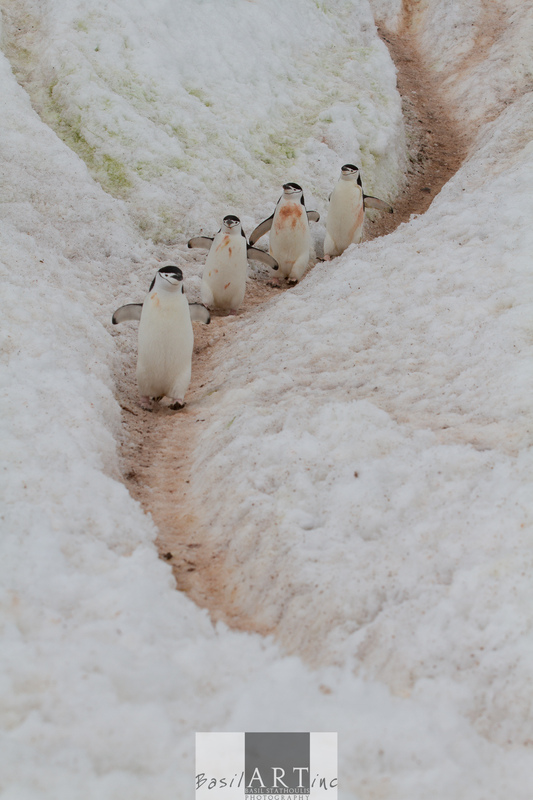 You have to step off to give the penguins right of way. 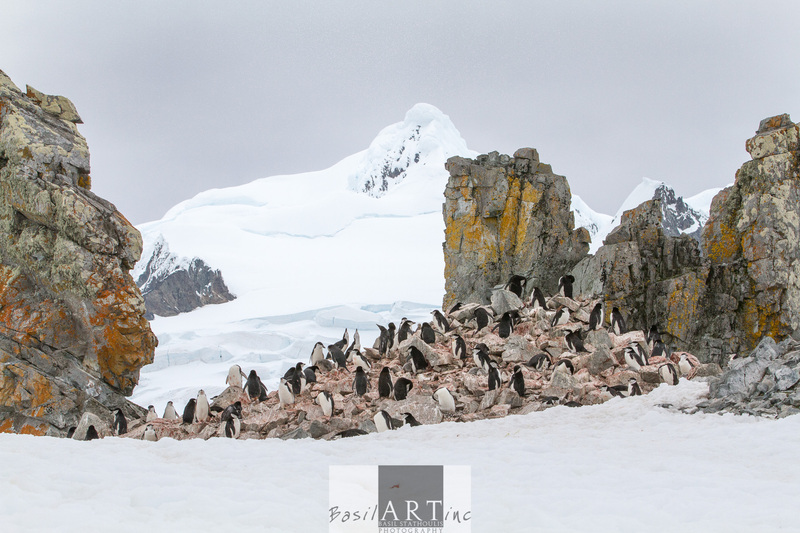 I was on my knees gazing at the sheer beauty of the colony nestled on rocks stained red with regurgitated feed against a backdrop of black peaks shouldering above the white ice. After a while I flopped exhausted onto my back and gazed up at the blue grey sky. Everyone passed me on foot and looked down at this crazy snowman. But I was so happy. And tired. I was exhausted by being bunk bound for so many days and not eating. But this was the new me on ice and snow. I moved to a saddle where a few people were sitting. 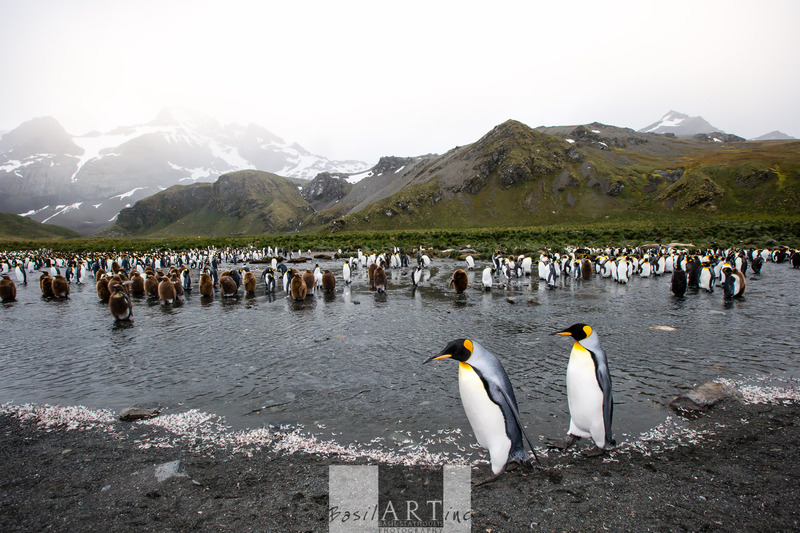 It was a great position as from our left we could see the penguins walking towards us along a contour, and from our right we could see the clean penguins coming up from the sea, cresting in the s-shaped path. young Chinstraps. We could see across the bay to glaciers carving their way through mountains reaching the sea. It was wonderful and invigorating to be on solid land again, even if it was covered with ice. 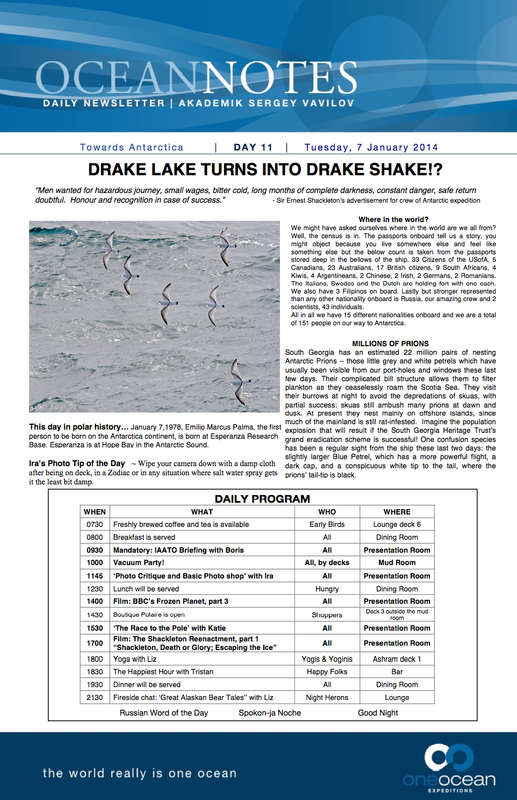 The outing broke three days of sailing and being ship bound. It was good to get back to the Vavilov and have a hot lunch. 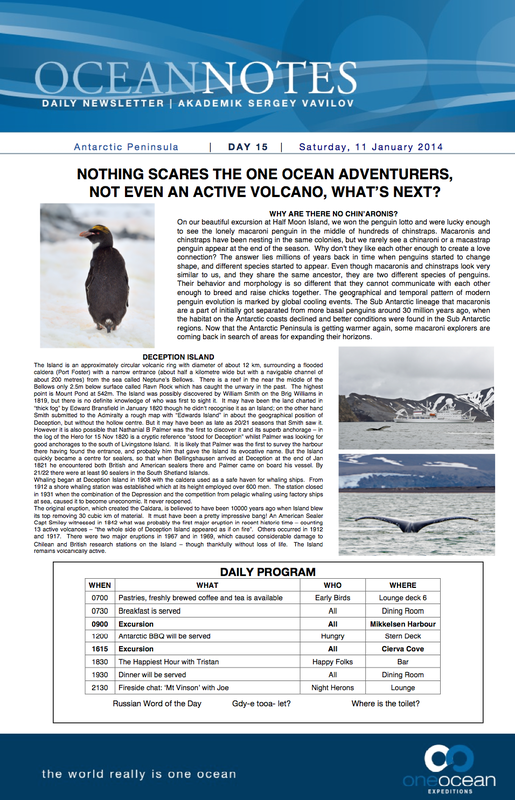 The topic at lunch was the visit to Deception Island and the Polar Plunge. Before the trip I had thought about the raw beauty of the continent I was to see, of the explorers of the last century and of the amazing wildlife spectacles I would witness. But I had no idea that people made a thing of swimming in the icy waters. I first saw this the morning before we left when I was doing some research on the small ship I had seen from the helicopter. But I knew I would want to do something crazy like that and soon I would be. We entered Whaler’s Bay on Deception Island through a narrow gorge. More tension showed on the Russian crews’ faces. About as much tension as on the faces of the rest of us who would be doing the swim. We landed in a Mad Max world of the remains of a whaling station. This was destroyed not only by the severe climate but also by a volcanic eruption in 1970. Yes, we were in the crater of an active volcano. The air temperature was -2 °C and the water surface temperature was 2 °C but close to zero a few centimetres below the surface. It had snowed heavily here two weeks before, and although thick snow lay on the slopes, the beach was dry with dust from the heat of the volcano. I took my gloves off and could not feel any warmth. Come to think of it, my feet were not warm either! Marius, Steven, Johan and I walked around the bay, up onto a hill and had a relaxing afternoon of fun photography. It is important to do that in photography, because if you do not have fun your pictures die a slow death. It always amazes me how photography ( or any creative pursuit) is just like life. Best to enjoy it. Ira Meyer (left) and me in full kit before the swim. No looking -we just ran into the water! that and came up with a mouthful of sulphurous volcanic gravel. Back on land everything froze. The wind had picked up. It was difficult to dress: numb fingers would not pull zippers, my face and head were locked in a grimace, trying to breathe but there was no warm air. I do not recall any of the pain of entering the water or submerging. Nor trying to run out onto the dry gravel. But the drying and dressing part was excruciating. After what seemed like a full moon rise we clambered aboard the zodiac and saw whales breaching between the Vavilov and the beach. On board I had a hot shower (I declined the invitation to the sauna with the girls on account of me still searching for my manhood) but took my bottle of whisky from duty free that had not been touched for two weeks up to the bar and celebrated. I was Polar One. Angela Polar Two. Danielle Polar Three. And Alex was Polar Four. 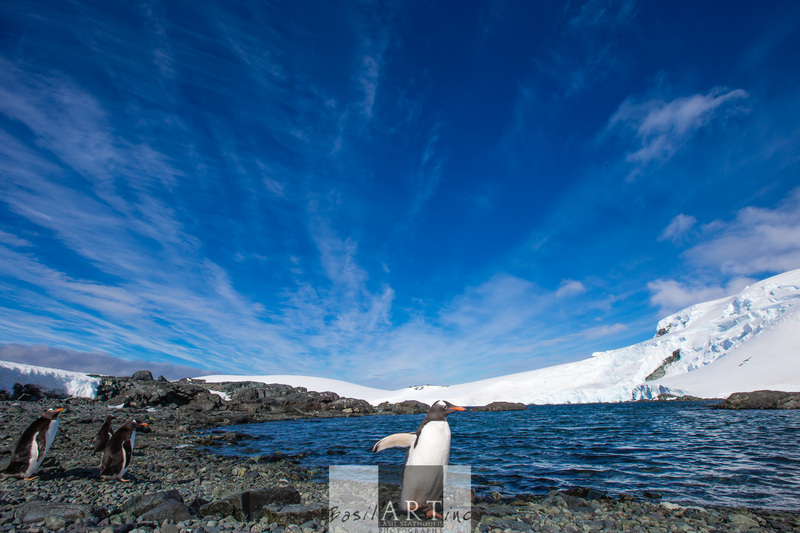 We were crazy enough to have gone for a swim in midsummer in the Antarctic waters. I was so happy. 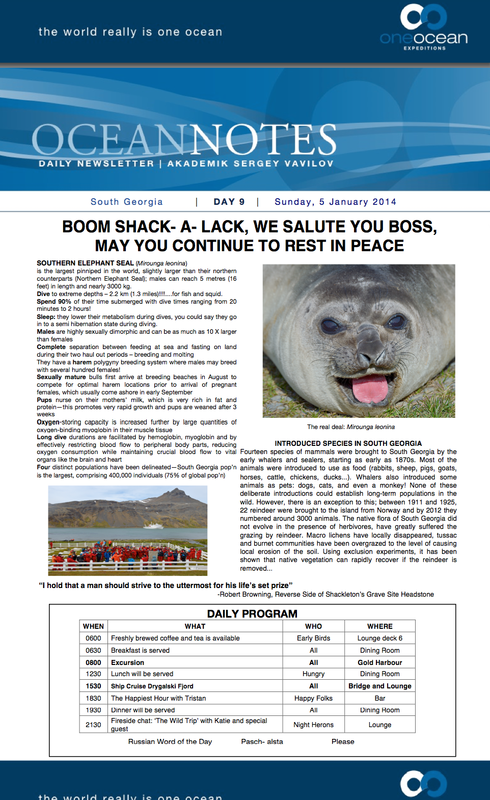 What a fantastic day on and about the Vavilov! 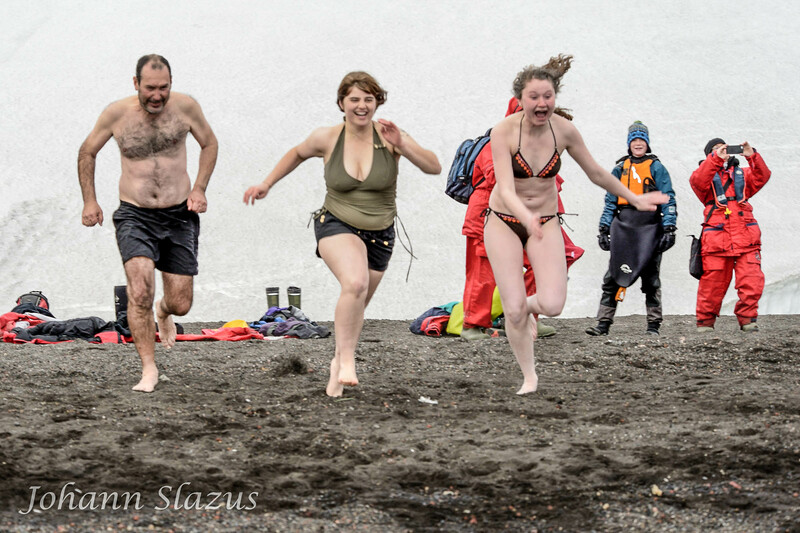 Thanks to Johan Slazus for the pictures of the Plunge. PS: if you have enjoyed reading this post and you can think of friends and family who would like to read it, please share. I started a course of antibiotics and took anti-inflammatories to control my fever. At least I was not nauseous. I just lay in my bunk alternately sweating in my shorts on top of the duvet then shivering under the duvet and two blankets with my thermal underwear on. 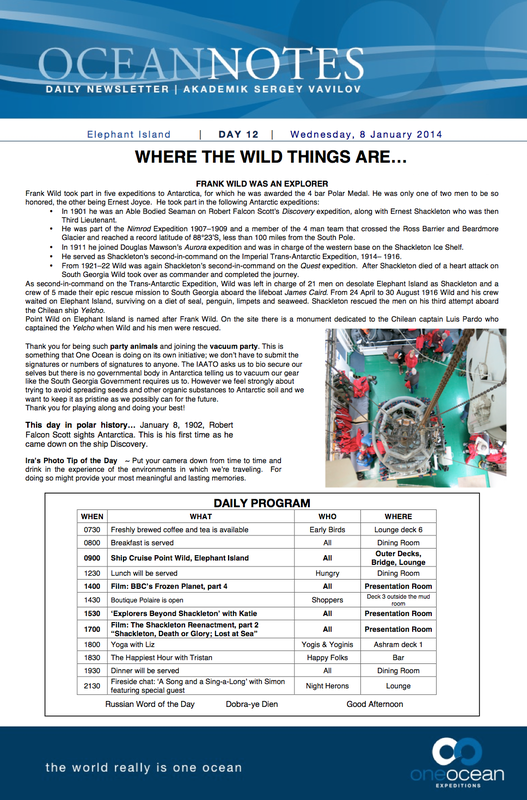 I left my bunk on the morning of day 13 on the Vavilov. 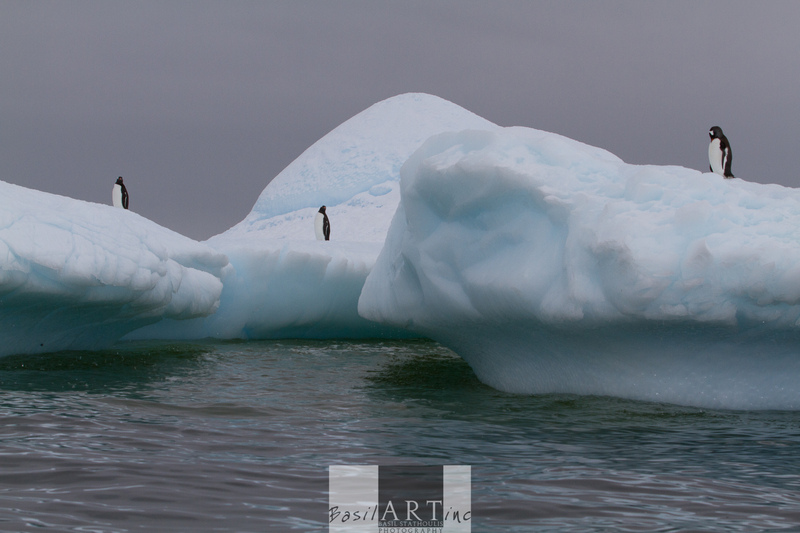 Over the last two days I missed incredible talks by the ship’s photographers, historian, biologist and ornithologist. I also was too sick to watch the reenactment of Shackleton’s journey across the Weddel Sea where a group of modern day explorers did the same trip from an ice flow to South Georgia in a small boat built to the original specifications with the same clothing and food: Shackleton, Death or Glory. 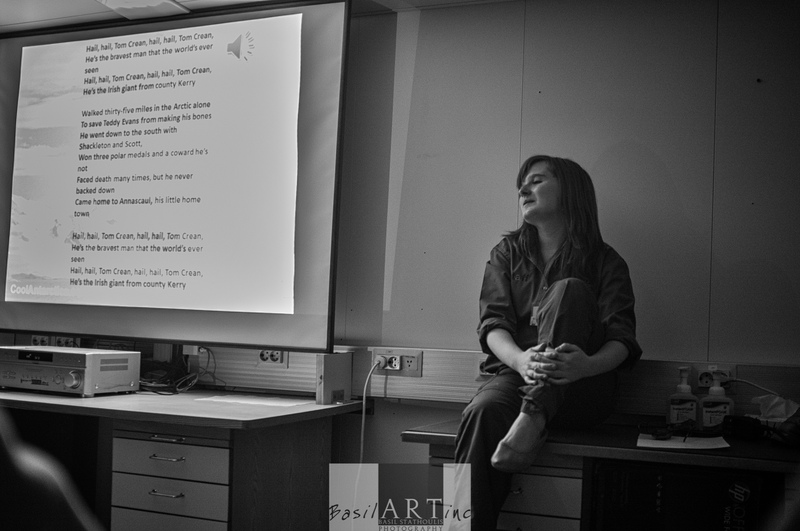 Katie Murray – in love with Tom Crean: eccentric and loveable Antarctic explorer and publican. 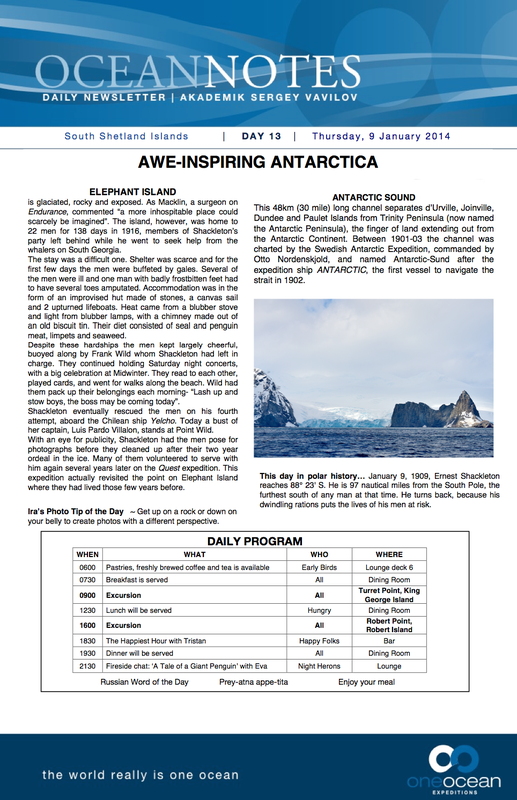 Day 13 was a crisp day with us cruising past Elephant Isle. The sky was a strong blue with streaks of cirrus clouds laying a soft pattern in the sky. The white of the clouds matched the snow and ice on the island. We got in close enough to see the bust of Captain Luis Alberto Pardo, the Chilean captain of a steam tug “Yelcho” that rescued Wild and 21 others. We had started their trip in reverse. First we saw the harsh Alps of South Georgia where Shackleton had landed and crossed the snow and ice laden peaks. 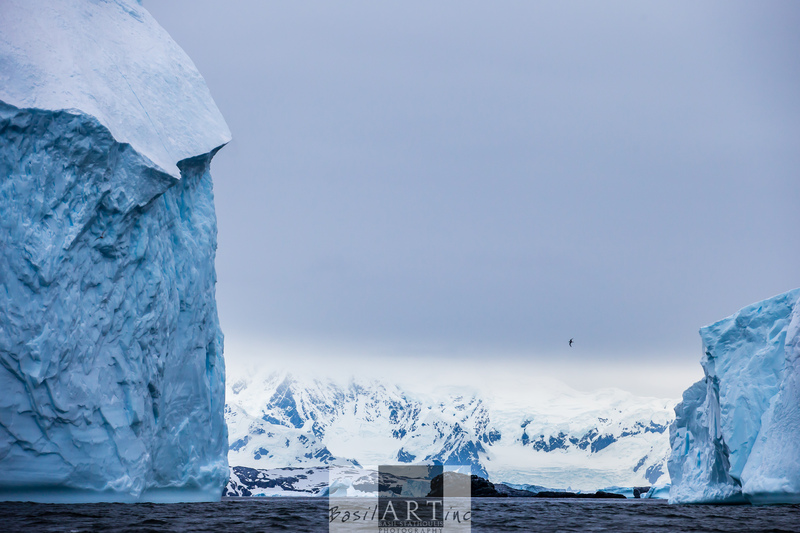 Then we crossed the sea to Elephant Island, and now we were moving towards the South Shetlands and we seeing icebergs along the way. Schackleton and all his men had survived an 800 mile trip through ice and storms. It is one of the most incredible expedition stories of our time. Although the expedition itself was not successful in it’s objective to cross the Antarctic from side to side, the journey expressed the strength of men and solid and visionary leadership. Shackleton was truly loved, admired and respected by his men. The story is worth a read or watch the film. I was flabbergasted, then remembered that this universe is filled with synchronicity. “I didn’t dream so much when I was on medication for depression”, she said, us not having said anything before except “Hi, where are you from?” She was from New York. “Now I dream more and talk about it a lot to my therapist” she finished, and sipped her smoothie. 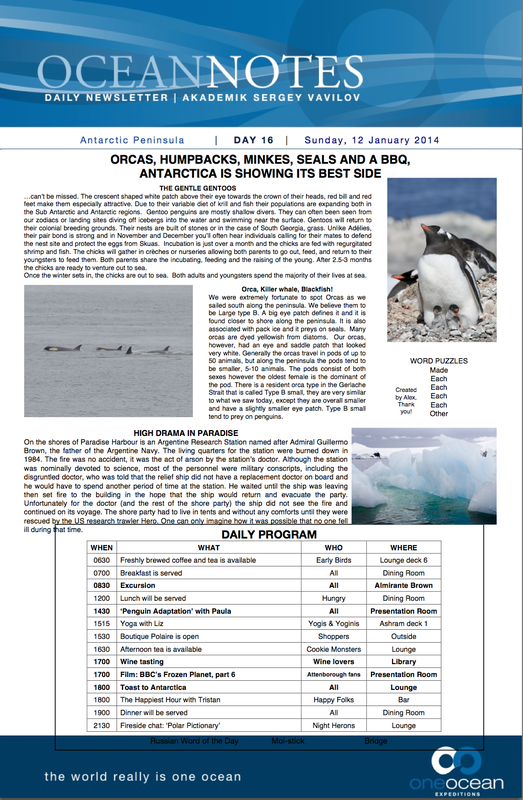 We parted and I continued my dream trip to the Antarctic. 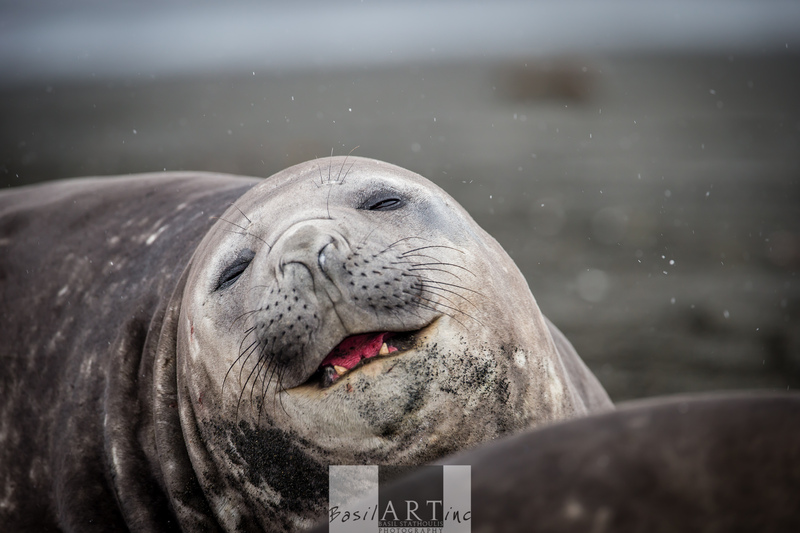 We landed on a stone beach in moderate surf amongst a group of Elephant seals. 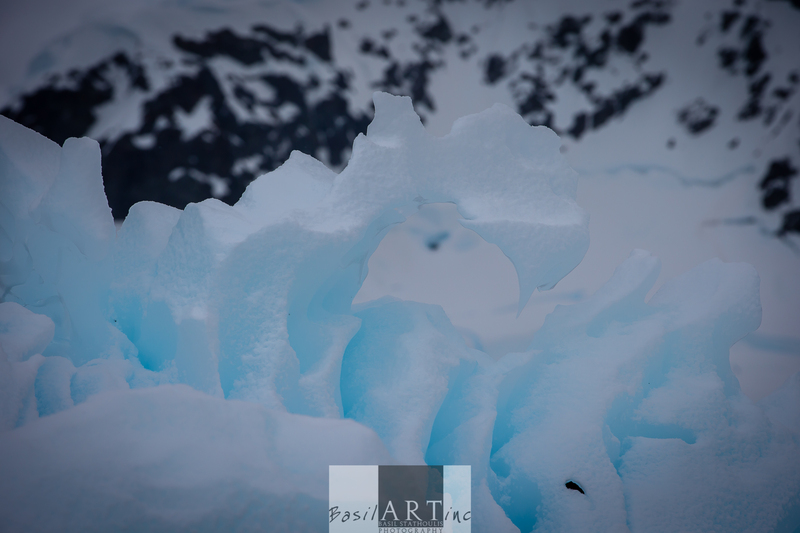 Grey-black clouds billowed over the mountains, attempting to cover the gun blue glacier face that divided the black cliff at the other end of the bay..
A loud crack and puff of pure white snow announced the birthing of the glacier. My fascination with the origin of names was worthwhile in this instance. Many have Greek derivation, as in the leonina for lion-like. But the Genus Mirounga is derived from the old Aboriginal word for these animals, whose range stretches to the Sub-Antarctic islands of New Zealand and Australia. 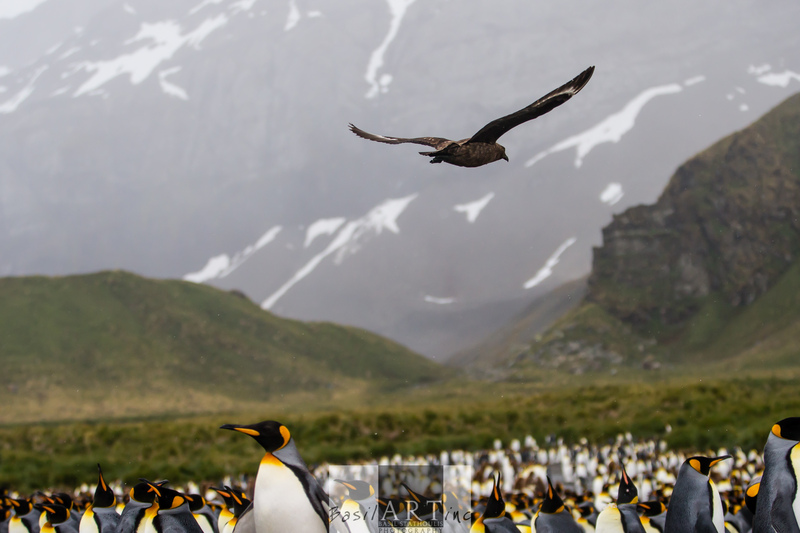 Simon led us to a breeding colony of King Penguins on the beach. He drew a line with his foot in the pebble beach to keep us from entering the thickest part of the colony. This line did nothing to prevent the penguins from coming to investigate us. 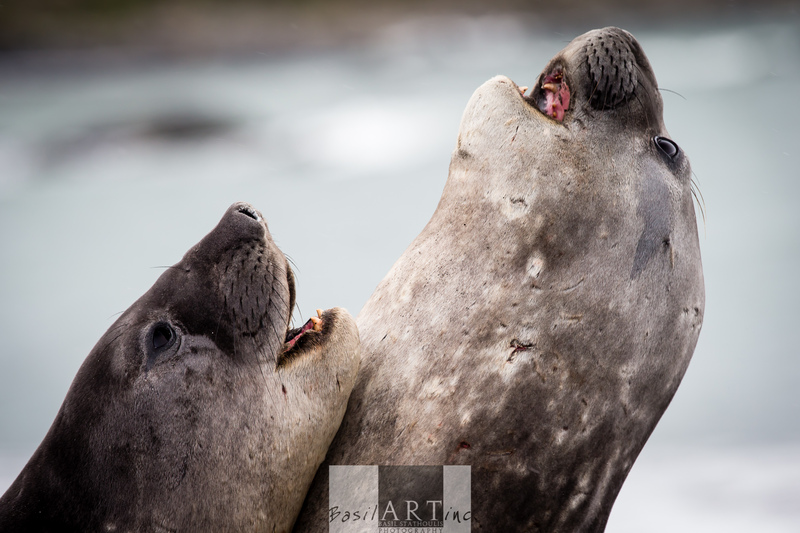 We set up to photograph in a jaw dropping position: penguins squawking; elephant seals jousting; penguins incubating eggs while last years hatchlings were bigger than their parents and covered in brown down; wieners barking and skuas flying and landing like scavengers at war. Then it started snowing. First lightly then much harder, then the wind picked up to break the muffled quiet of the snow. 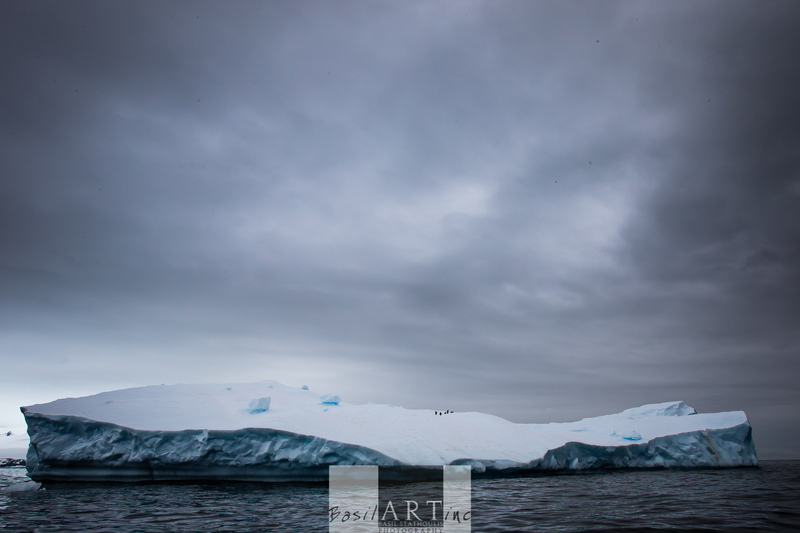 Many of the group slowly returned to the zodiacs and the ship, but we stayed till the last and were frozen, even with thick and proper layered outdoor gear. 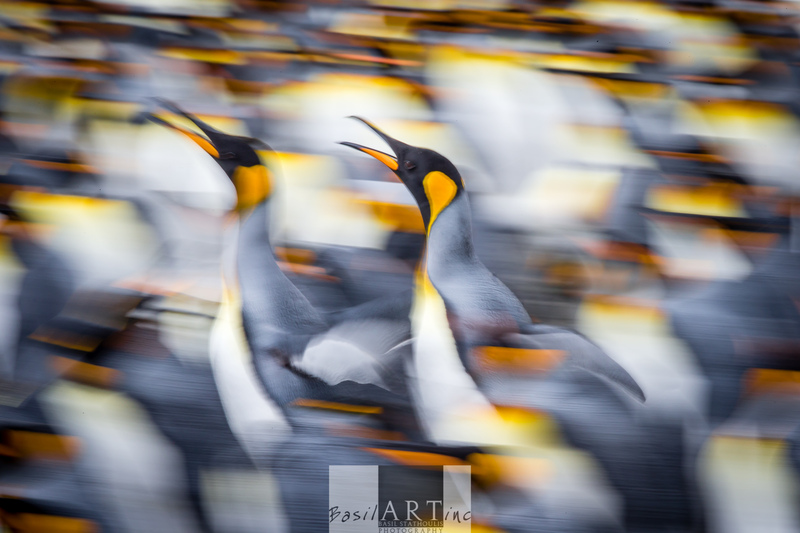 Marius had a moment of genius when he noticed penguins waling through the brood and panned them at a slow shutter speed. He gracefully shared his idea with his clients. What a great and generous photographer. Have a look at his website here. Back to the ship and we were all on a high from an intensely beautiful yet rugged morning. It was to be the birders afternoon as we cruised onto Drygalski Fjord. The bridge is open at all times to passengers but the tension is palpable as the captain and crew negotiate the narrow entry into rocky harbours or fjords. I am sure they must use some vodka to distress afterwards. 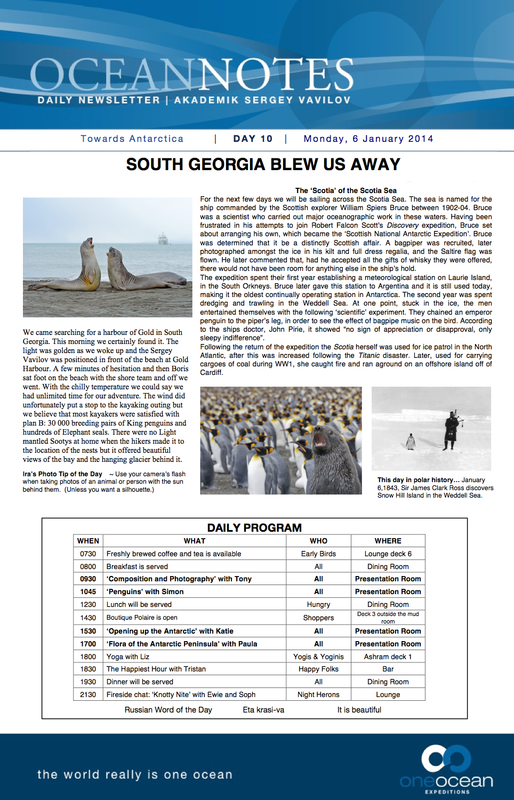 The birders were there to see the last remaining South Georgia Pipits, the most southerly passerine in the world and endemic to South Georgia. There was a rat free island here where the bird could breed and the eggs were not destroyed. The birder’s disappointment was audible when the ship had to swing around in the fjord and exit because of a snowstorm. The next two days saw us crossing the Scotia Sea. I survived the trip in terms of motion with three drugs now: Epanutin, Stugeron and Scopolamine. Then I was struck down by ‘flu, and took to my bunk for another two days of hallucination. 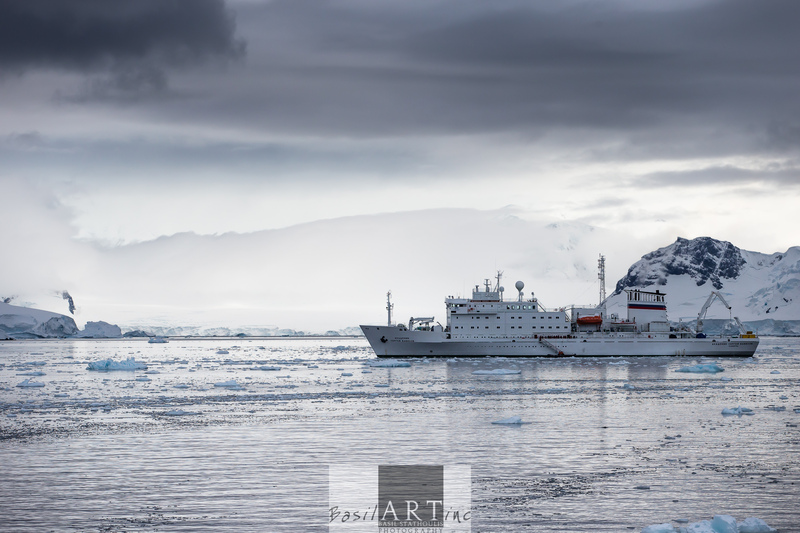 But when I surfaced we had crossed 60 degrees south and we were in the thick of ice. Marius Coetzee’s Idea. Thank you! Life through the lens of my camera. 52 weeks in a year. 52 South African portraits. 52 chances to take a second look. As you set out for Ithaka hope the voyage is a long one, full of adventure, full of discovery. just another lifestyle blog...with a hint of ouzo!